Partial knee replacement is a surgical procedure that replaces one of the three compartments in the knee. A normal knee is made up of three parts, medial (inside), lateral (outside) and the patellofemoral (kneecap) compartments. When only one part of the knee is diseased, then it is potentially possible to only replace the damaged part leaving the rest of the knee untouched. This is called a partial knee replacement or uni-compartmental knee replacement. 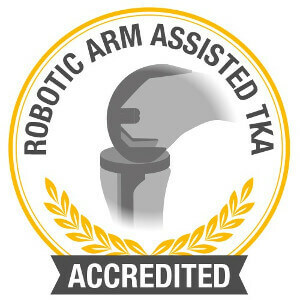 The MAKO UKR is partial knee replacement performed using the robotic navigation MAKO platform. A special CT scan is performed of the knee for 3D preoperative planning. During the surgery, the surgeon feeds realtime information about the patient’s knee back to the computer system and surgical planning is fine-tuned to better balance the knee. 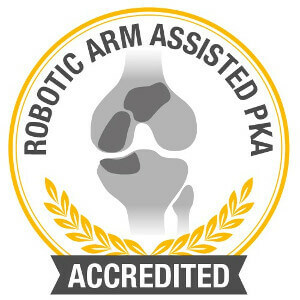 The MAKO robotic arm then assists the surgeon to perform bone preparation with precision for the final implantation of the partial knee replacement. The components are secured in placed with bone cement. Sydney Adventist Hospital is the first hospital in NSW to acquire this technology. The advantage of an UKR over a total knee replacement (TKR) is that the kinematics of the knee is maintained and therefore patients feel that the partially replaced knee is more natural compared to a fully replaced knee. Patients recover faster, report better satisfaction and return to more physical activities compared with patients with a traditional TKR. Patients may continue to experience mild symptoms from the unreplaced parts of the knee. Patients may require secondary procedures if the unreplaced parts of the knee significantly deteriorate. Am I suitable for a MAKO UKR? Patients with limited osteoarthritis of the knee who does not have any significant deformities may be considered for a UKR. Make an appointment with Dr Lin if you want to discuss your suitability for this unique procedure. How long will my partial knee replacement last for? It is different in every individual, but generally the more the patient demands of it, the quicker it will wear out. The goal is to achieve many years of great function and quality of life. For many patients, a conversion to a total knee replacement will be required sometime in the future. 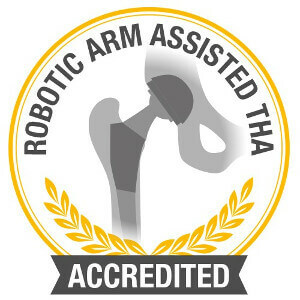 The Australian National Joint Replacement Registry [https://aoanjrr.sahmri.com/home] records the details of every joint replacement performed in Australia and has collected such details since 1999. 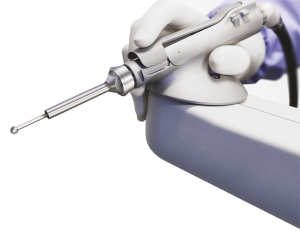 Because MAKO UKR is a new procedure recently introduced in Australia in 2015, no long term outcome from the Australian Registry is yet available, however, the published mid term results from the United States are promising. Repetitive impact sport such as jogging is NOT recommended. Most patients find that they return to most activities with time. We do not recommend people to drive after surgery until they can walk unassisted without a limp. This may take 2-4 weeks.